(Newser) – It was one of Arizona's most notorious murder cases: the executions of nine people, including six monks, at a suburban Phoenix Buddhist temple. Two men were imprisoned for life in the 1991 killing but in 2011, an appeals court overturned the conviction of Johnathan Doody, ruling that investigators improperly obtained his confession. After two more trials, the first of which ended in a mistrial, the victims' families finally got what they had hoped for yesterday when Doody was once again convicted of nine counts of first-degree murder and 11 armed robbery and burglary charges. For over 2 decades the people have paid for the food and housing of this murderer. Justice delayed is justice denied. Lawyers and liberal judges excel at delaying and denying justice. The murderer should have been executed within a year of his deeds. No wonder crime is so rampant in the US! 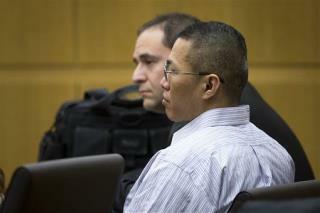 The Chinese should start lecturing the Americans on how to improve our judicial system. No more delays over trivialities. And by executing all the murderers, there would be room in prisons for those convicted of lesser crimes.